Okay, I mentioned I would write a blurb about each of my cookbooks to help people in the decision making when it comes to buying my cookbooks. I would love it if people could buy all of them, but that is not always possible. This book is the biggest low-carb cookbook of all of them and is the very first one I wrote. It became a national best seller along with 2 other cookbooks of mine. Each cookbook is divided into categories: Helpful Hints, Beverages, Appetizers, Soups and Salads, Eggs, Meat, Poultry, Fish and Shellfish, Vegetables, Sauces, Jams, Chutnesy and Dressings, Breads and Other Baking, Frozen Desserts and Puddings, Cheesecakes, Cakes, Pies,Confections and Frostings, Cookies and Squares. The recipes are strong (I don't put 'em in if I don't like them), however, in hindsight, candidly, I would say there are 3 or 4 weak recipes and that's not bad given that there are about 300 recipes in there not counting the 50 or so variations. The two that come to mind are the High protein tortillas (I have another tortilla recipe in there that received rave reviews from fans so not to worry) and the low-carb pasta (what was I thinking? Use Dreamfields folks!). My Maple Syrup could use some work according to someone's review (however my family really liked it - go figure! ), but you know what it's easy to buy one of the commercial varieties. My two favorites are Estee Sugar Free Maple Flavored Syrup and Walden Farms Calorie Free Pancake Syrup (both made with Splenda and sorbitol free). Other than that, I can't think of any others offhand, but thought that may be helpful to mention. I am sort of proud of the rest of the recipes though. Many are breakthroughs for low-carb dieting and I think I was one of the first authors to provide such a comprehensive baking and dessert section using Splenda only (of course), besides there being many regular recipes too. To give one an idea of the baking section. At this point in my low-carb life, I really missed bread, so came up with a bake mix or two (using regular ingredients) and made many machine bread recipes, etc. I even have a bake mix that may be used cup-for-cup for all-purpose wheat flour in your favorite recipes. It is called "Ultimate Bake Mix" and there are several alternatives plus a self-raising type flour substitute. I have a Bran Bread, Cheese Bread, Garlic Bread, Focaccia, Hamburger Buns, Flax Bread, Cinnamon-Swirl Egg Bread (this is like Cinnamon buns almost exactly with the Cream Cheese Frosting), Braided Flax Bread, Oat Bran Bread, Apple-Cinnamon Lattice Loaf (a favorite of my sons), Carrot Bread and a Yeast free and baking powder free Flax Bread. In addition, find pancake, crepe, pizza crust,cracker and loaf recipes, plus donuts! The donuts, for instance are 2.3 g carbs each. The Chocolate Eclairs are 6.9 g carbs each. Crackers are l gram, tortillas are 4 grams, crepes, 2.7 grams, etc. I have a Thickening Agent which is used to thicken sauces, soups and stews. It is easy to make and is as good if not better than the popular Thicken/Thin Not Starch by Expert Foods. I find one needs less of mine to do the job. 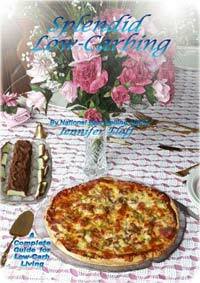 Confections and Frostings: Have you ever seen such a category in any other low-carb cookbook? Every cookbook I wrote has this section due to my love affair with chocolate and fudge and candy-like treats which are now made sugar free and high protein and still taste decadent. How would you like to try Chocolate-Drizzled Marshmallows, milk chocolate, chocolate peanut butter fudge, a drizzling chocolate for desserts, Creme Fraiche, Half a dozen creamy frostings made with a low-carb confectioner's sugar substitute, marzipan, chocolate after dinner mint log, chocolate walnut fudge, raspberry cream truffles and several variations, white chocolate,and fudge toffee? Some of my other books offer even more exciting options such as Black Forest protein bar and even nicer white chocolate,like real fudge, caramel, condensed milk and you name it. You know how often in low-carb cookbooks, the crusts for pies, quiches and cheesecakes are often left out to reduce carbs? I typically did not do that. I like to have the whole enchilada so to speak. In the Frozen dessert section, I have the best Strawberry Frozen Yogurt with many variations. My friend, Mary Converse in Montana makes the Strawberry recipe very often. If you prefer Sherbet, there are refreshing Sherbet recipes. How about instant ice cream or 7 different ice creams requiring an ice cream maker. There are jams and chutneys and sauces and dressings in this book that are useful - even a homemade ketchup, mayonnaise, pickles and thousand island dressing. This book has the best Eggplant Parmigiana recipe, great salmon or tuna burgers, bobotie (a national meat loaf in South Africa), breakfast options, Cream of Cauliflower soup with many variations, mulligatawny soup, shrimp and curry soup, etc. In the Appetizers section I make the Bacon Cheese Spread and the Mexican dip all the time to rave reviews. The curried walnuts are different and excellent and the spiced almond clusters make a great Christmas gift, placed in a pretty tin. There are a few really good cookie and square recipes, but typically my later books have even nicer recipes in this particular category. The pies and cheesecakes in this book are very strong. My Fruit Pizza is something I often make. It is beautiful and looks like a work of art and some folks have said it is the best dessert they've ever tried, and the same goes for my Fruit Cocktail Cheesecake. Overall, this is a great book that I reference every week to this day. It has a ton of recipes and some photos on the back and front, plus on the website, www.low-carb.us. This cookery book took a lot of my time and energy (and even tears) but hopefully people will appreciate it.